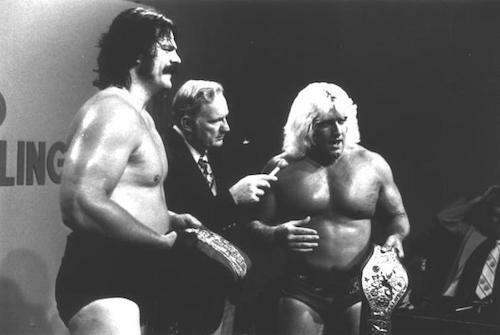 After giving the fans on the October 15, 1975 Mid-Atlantic Championship Wrestling television show a dominating victory over young Kevin Sullivan, a clearly energized returning Blackjack Mulligan spelled out to announcer Bob Caudle his vendetta against Wahoo McDaniel and his plans going forward. When the television tapings continued later that night at the WRAL studios in Raleigh, Mulligan continued to be in rare form! On the Wide World Wrestling TV show, Blackjack thoroughly demolished the up-and-comer Ron Starr, and then turned his attention to the fans and announcer Ed Capral. Before Capral could barely utter a word, Mulligan interrupted and exclaimed, “Let me ask you one question Mr. Announcer. What do you do, what can you say when you give a man your best punch? You hit ‘em with everything you’ve got? You have your best day, you give your heart and soul…you hit ‘em and he goes down and he gets back up. What do you do?” Of course, the hyped-up Mulligan didn’t give Capral a chance to answer! Blackjack continued unabated, “I’ve been hit with everything the Indian can throw; I have been hit with everything that Paul Jones can throw. I have been hit with everything Rufus can throw…the headbutt does not work on Blackjack Mulligan; Kenneth Patera’s muscles are synthetic!” After bashing the territory’s “good guys,” the big Texan wanted to let the fans know exactly who they were going to see in the months to come. 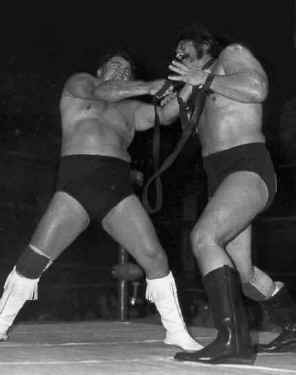 Wahoo McDaniel in a strap match. An obviously taken aback Capral quipped, “Blackjack Mulligan…if you don’t believe he’s great, just ask him!” But the announcer then added, “And obviously this man can back up what he says.” The last point was the significant one, as Mulligan would light up the reeling territory, and set it on a course of greatness for many years to come. The Mid-Atlantic area desperately needed a shot in the arm in the middle of October of 1975, and Blackjack Mulligan provided that and then some. The rocket-ship called Mid-Atlantic Championship Wrestling was now ready for lift-off!